TLDR; AUS Blockchain Hub launches, He3Labs demos NEM blockchain eGovernance at Crow Fair, Shanghai partners with Bihu, XEM added to Coinspot, MoUs have been signed with BitTemple, Incublock, FoundationX, and the Ministry of Economy of the Republic of Abkhazia. 	We launched the first Australian NEM Blockchain Hub at The Precinct in Fortitude Valley, Brisbane. Hosted by Jason Lee, it was a fantastic turnout with lots of guest presenters including Nelson Valero, Paul Russell from Advance Queensland and our partners including TravelbyBit, Free Market Token, CopyrightBank and Open Meter. 	Jason Lee was featured on Coincast TV which premiered at the Blockchain Hub launch. The interview can be found HERE. 	NEM Australia & NZ had a successful Leadership Summit in Brisbane where over 20 team members and partners gathered at the ‘NEMhouse’ to consolidate our vision, cement our values and clarify our roles and goals as an organization. Read more about it HERE. 	Australia Leads, Jian, presented a NEM 101 at the Blockchain Centre on Monday 20th August and Thanh Le presented in front of Chinese Delegates and Officials in Sydney on 13th August with Lecky Lao giving the audience an overview of the NEM nano wallet. Gordon Christian also hosted a blockchain information session in Agnes Water, Queensland. 	We have two events coming up in which NEM are participating in: The Blockchain APAC: Australia’s Biggest Blockchain Enterprise Event. 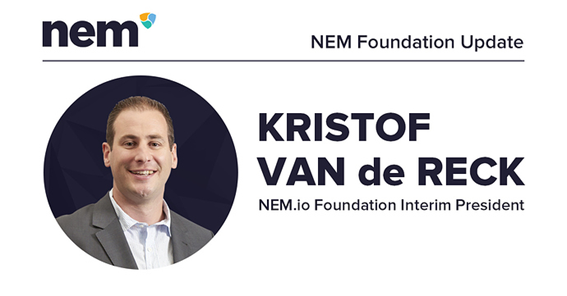 We have a special Discount Offer: Enter the code ‘NEM100’ for $100 off registration. 	We are also participating in the Blockchain and Philanthropy event on 31 August at RMIT University; you can RSVP for your free ticket HERE. 	Our ecosystem is growing, and we are adding lots of profiles to our Medium page such as Easycrypto in NZ. You can view the profiles of all our current members HERE. 	XEM was added to the Coinspot exchange in Melbourne, Australia. 	China Regional Head, Steve Li, gave a presentation on Catapult and gifto to the Asia Innovation Group in Beijing. 	Steve was on a panel at the IB Congress event in Chicago on August 17th. 	In Brazil NEM continues its expansion. 88Insurtech, an insurance industry startup, begins testing the NEM protocol for initial document authentication. 88Insurtech has received awards from Unesco for its social aspects and innovations in the insurtechs sector. 	The Brazilian ambassadors are advising on a real estate project in Peru, which will use an ICO as a way to raise funds. 	Ambassador Alex Braz is working with a startup called Podium which will soon be the first Brazilian ICO to use the infrastructure of NEM. The Podium project is an achievement of Felipe Fonteneles, a former volleyball player and Brazilian Olympic champion. 	Another partner of NEM, PundiX, announced the installation of a desk in the country to facilitate its operation throughout Latin America. 	The Ambassador, Daniel Tolosa, ran a Meetup workshop of Apostille in Santiago on August 21 and had a meeting with Andres Bello, the Director of the University, to finalize agreements with NEM. 	On August 18th a special NEM 101 was held in Bogota in the event “El Futuro de la Blockchain en Latinoamérica” Hosted by Pedro Gutiérrez who made the Catapult presentation to 300+ people. 	On August 21st a new NEM 101 Meetup took place in Pereira city, which is the country region being famous for Colombian coffee farming. 	Colombia ambassador, Rafael Torres, traveled to Medellin City to participate in the Antioquia University event and also to meet with one of the largest banks in the country to show NEM potential and persuade the idea of a NEM PoC. 	NEMsp Network training is going well and expanding. More details will be shared in the coming week. 	The Ready Play Go team presented their project in Hong Kong. NEM Thailand member Nigel Hughes and Ricardo Medrano from NEM Hong Kong were at the meetup and helped educate attendees on NEM. 	Engate Inc. held a Blockchain Boot Camp that was the first hands-on training for engineers to learn about NEM and Ethereum in Tokyo. It aimed at educating engineers for spreading blockchain technology and expanding the market growth. 23 people joined, and learned about the use case of blockchain and did workshop through for four days. 	The Japan team met with BLOCKTEMPO, Taiwan’s biggest crypto-media and discussed future partnership opportunities. More details forthcoming. 	LATAM lead, Pedro Gutierrez, participated in the Las Vegas event, ChainXchange, and had conversations for an alliance with a company of artificial intelligence and smart cities that has offices in different parts of the world. 	The LATAM team will participate in the Blockchain Summit of Uruguay along with Jeff McDonalds and Alexis Trujillo. 	NEM Malaysia was invited to speak at the 6th Sabah International Surveyors Congress and 2nd ASEAN Land Governance Summit held in Kota Kinabalu Sabah from 15-16 August. NEM Southeast Asia Regional Head, Stephen Chia was there to give a talk on blockchain in land governance. NEM Malaysia together with systems integration (SI) partner, Sabah Net, had a booth set up during the conference to interact with the delegates of the summit. The Sabah government has shown deep interest in blockchain for land title management and NEM Malaysia together with SabahNet have also collaborated to work on a land title registration, sales and transfer pilot for the Sabah land office. 	NEM Malaysia was also involved in The Malaysian Entrepreneurs Festival (TMEF) in both Seremban and Alor Setar. The TMEF aims to empower start-ups, cultivate entrepreneurship and SMEs entrepreneurs no matter which community they may hail from. Jesyka Hiu from NEM Malaysia Business Development was at both TMEF Seremban and Alor Setar to give a NEM Blockchain 101 talk to the entrepreneurial community in both towns. 	Austin Martins led a successful Meetup at the Bayero University Kano on August 14th. 	Alex was interviewed on the FutureTechPodcast (available HERE) and will be interviewed next week in California for an upcoming TV blockchain documentary. 	NEM Advisor, Jeff McDonald, and He3Labs (NEM systems integration partner) showed off a demo of a blockchain eGovernment system for the Crow Tribe at the 100th Crow Fair in Montana. 	The NA team will be meeting with the United Nations in September. 	NEM Philippines has signed a partnership with Cagayan Economic Zone Authority (CEZA) during the Business Law Conference 2018 last July 28th held in De La Salle University in Manila for the Blockchain education and development. The purpose is to raise awareness, promote, and educate Blockchain technology to the people, which is why the first Blockchain Hub is set to rise in Sta. Ana Cagayan where activities such as university tours, hackathons, workshops, forums, and conferences will commence. 	NEM Philippines also signed a partnership with Ateneo De Manila University on August 8 during the launch of the AMBER Lab, the first university-based blockchain research lab. NEM Philippines and Ateneo will also focus on NEM Blockchain education and look to have a blockchain elective course as part of the partnership. 	NEM Philippines will be having its 1st year anniversary on Sept 1, 2018, and looking to have an anniversary meetup with its partners and blockchain community. 	NEM China also held a meetup at Lujiazui, the financial center of Shanghai, attracting over 40 international visitors. Steve and Kimble did a presentation. 	NEM Singapore has recently signed a MoU with BitTemple a blockchain hub company and coworking space operator that has a presence in Singapore. Signed by NEM Singapore Lead, William Tan and BitTemple’s Project Director and General Manager of International Department, Dada Zhang, the MoU will see NEM and BitTemple work together on enrichment programs that will create awareness of blockchain in Singapore which will be held at the BitTemple Singapore premise, where NEM Singapore is also stationed. The MoU will also see NEM conducting monthly blockchain clinic sessions and talks on NEM technology and use cases for the blockchain community together with BitTemple. 	Business Finder was a sponsor for the August 15th NEM Meetup in Mosselbay. 	The South Korea team signed a MoU with Incublock and also the blockchain accelerator, Foundation X. The MoU was signed between Leroy Mah, Interim NEM Korea Head, and Sungjae Hwang, the CEO of Foundation X. 	Laura Takenaka, Thailand Country Lead, attended the ASEAN Digital Economy Summit (ADES) in Bangkok on August 9th as a panel speaker where she spoke on Building and Maintaining a Global Community and How to Engage and Think Glocal. 	NEM Ukraine team is preparing for the first Meetup for government and business structures and takes place on August 31st in Zaporizhzhya. 	The first NEM 101 meetup in Donetsk region will happen in Pokrovsk. 	The NEM Ukraine team is preparing for three upcoming events in Kiyv: BlockchainUA conference (NEM gold sponsor), NEM Global team Meetup and a NEM TECH meeting for developers. 	Ukrainian press CRYPTOTA interviewed NEM Ukraine leader, Anton Bosenko, concerning the possibility of election holding, using NEM blockchain. 	The NEM Ukraine team took part in the Professional Government Association of Ukraine Summer Social Gathering meetup with future agreements being discussed. 	Members of the team will be speakers at the Kyiv Blockchain Forum on the 3rd of September, where they will give a speech on the topic: “NEM in action. Less words, more actions”. 	On August 16, NEM 101 meetup was held at the University of Montevideo. The presentation was very popular among the students and the general public that attended. 	A NEM workshop is being planned with the Catholic University of Uruguay, for September/October. The team is in talks with the Engineering Faculty of the University of the Republic. 	On September 5th the Uruguay Blockchain Summit conference will happen and we will have a booth and the event will be attended by NEM Advisor, Jeff MacDonald, NEM LATAM Lead Pedro Gutierrez and NEM host Alexis Trujillo. In addition, a technical workshop will be held by Emilio Pereira. 	On the possibility of partnerships, I continue to move forward with Nicolás Roselli on the meat traceability undertaking where the Blockchain of NEM is to be used. I am also reviewing a venture with Nicolás Pereira to tokenize on NEM an existing educational solution. We are moving forward and supporting this to happen.